City Sports Grill staff, food, and bar are great and there’s room to dance. What a night! Don’t miss this one. Valentines Day with Red Satin, The best swing, jazz, contemporary, funk, classic rock and big band from over 7 decades of great music. Mill <?XML:NAMESPACE PREFIX = ST1 />Pond Park, Garfield St.
HARTFORD, Conn., April 1, 2010 , "Red Satin", a Connecticut based band was selected to share the evening's entertainment with the United States Marine Drum & Bugle Corps during the upcoming 48th annual New York Leatherneck Scholarship Ball. The event which will be held on April 23, 2010 at the New York Hilton is one of 4 national fundraising events and is the cornerstone fund raising event of the Foundation. "It is an awesome experience to be a part of an initiative that recognizes the commitment and sacrifice of so many U.S. Marine Corps families," said Frank Pappalardo, Music Director for "Red Satin". "We are extremely honored to have the privilege of performing at this event and for such a great cause" added Val Rogers, Vocalist. 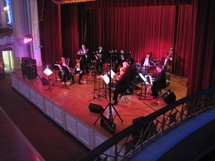 A CT based 12-piece band "Red Satin" is part of the Frank and Val Entertainment group. Playing a wide variety of music, "Red Satin" combines for great listening and dancing. Frank Pappalardo and Val Rogers have been entertaining a wide range of audiences since 1990. Known throughout the region Val Rogers is a consummate vocalist and performer. Her work in musical theater, USO, and as featured vocalist with top bands has gained rave reviews: "complete performer", "the best" and "great voice" are just a few. Frank Pappalardo, emcee and bandleader, brings his extensive resources as bandleader, commercial voice-over artist, musician, and event producer. Together they have assembled the regions finest musicians in "Red Satin" for one fantastic band! The mission of the Marine Corps Scholarship Foundation is to provide financial assistance in the form of scholarships for higher education to deserving sons and daughters of Marines, with particular attention being given to children whose parent was killed or wounded in action. Since 1962, the Foundation has awarded over $42.5 million and 24,000 scholarships to support our Marine families. This academic year, almost 1,400 children of Marines received over $3.5 million. This great event helps to continue their tradition of "Honoring Marines by Educating Their Children." Of special note, MCSF has recently embarked on a historic fundraising campaign with a goal to double the average scholarship award to $3,000 a year for children of current and former Marines and endow their commitment to award $20,000 in scholarship assistance to every child of a Marine, or of a Navy Corpsman serving with the Marines, whose parent is killed in the Global War on Terror. This is a five year capital campaign (2006-2010) to raise $50 million and is entitled "American Patriots Campaign". Check back soon for more schedule updates!